The Cadillac CT6 is a beautiful luxury sedan and for the 2019 model year, the range-topping model finally joins the V family – sort of. It isn’t a CT6-V, but the new CT6 V-Sport packs the new 10-speed automatic transmission, a uniquely tuned magnetic ride control suspension system, Brembo brakes and – most importantly – a new twin turbo V8 engine. Right now, the 2019 CT6 is the only car officially slated to get the new twin turbo V8, but it seems unlikely that General Motors would take on the cost and effort of designing a V8 that is so different from the rest of their V8 engines. It seems likely that the new 4.2-liter twin turbo V8 will eventually be offered in something else and with the rumored mid-engine Corvette expected to arrive with a very similar engine – this could be our first look at the next generation supercar engine. Once again, I want to start by pointing out that GM has never offered up any official information on the existence of a mid-engine Corvette project, but videos and spy shots suggest that the company is definitely working on some sort of sports car with an engine mounted behind the driver’s seat. On top of those spy pictures and videos, CAD images showing what is believed to be the mid-engine Corvette surfaced online late last year and those colorful images included a twin turbo V8 with a dual overhead cam design and reversed cylinder head air flow. This design allows the complete engine package with the turbochargers and piping to take up less space in the engine bay, which is helpful when the engine is tucked behind the seats. As luck would have it, the new twin turbo V8 in the 2019 Cadillac CT6 V-Sport has a dual overhead cam design and a reversed cylinder head air flow, just like the engine rumored to power the also-rumored mid-engine Corvette. 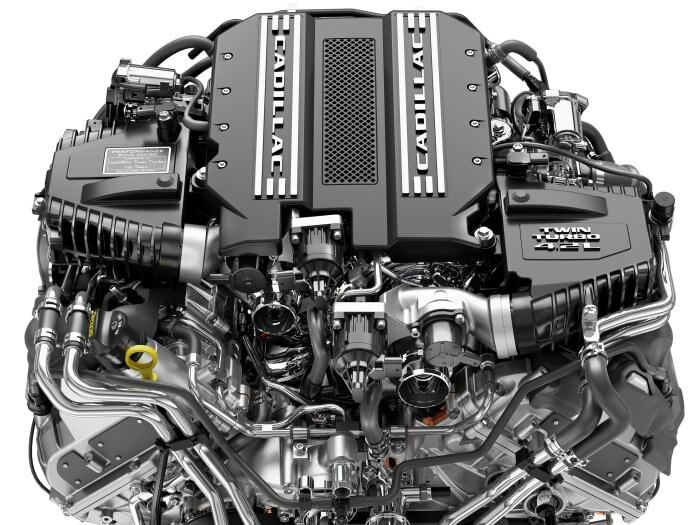 While I am generally quick to downplay rumors about rumors, it seems interesting that the new Cadillac just so happens to have the exact, unique engine design that the CAD images of what is believed to be the mid-engine Corvette show. For those who are unsure, all of the popular GM V8s over the past few years have been an overhead valve design, with the camshaft located inside the engine block with pushrods connecting the rocker arms to the cam lobes. Also, the intake manifold (and supercharger, when applicable) sits on top of the engine and the exhaust manifolds hang off of the bottom, but with the new Cadillac twin turbo V8, the cylinder heads exhaust through the top and there are two intake manifolds, one below each cylinder head. This design allows the engineers to place the turbochargers and the integrated exhaust manifolds in what would be called the “lifter valley” on a push rod engine. The exhaust gases spin those turbos which compresses the intake air and after a short stint through a pair of air-to-water intercoolers, that air is shoved into the underside of the cylinder heads. This system allows Cadillac to offer 550 horsepower and a bone-crushing 627 lb-ft of torque, surely making the 2019 CT6 V-Sport very quick. Some rumors suggest that the mid-engine Corvette will only be a premium performance model, running alongside the front-engine C7 models, but if there is a “base model” mid-engine Corvette – this seems like the perfect engine. It fits with all of the rumors and CAD images, and with 550 horsepower and 627 lb-ft of torque, it would be significantly quicker than the current base Stingray at 460 and 460 lb-ft of torque. At the same time, this engine would leave plenty of room for a more powerful model, presumably something along the lines of the new LT5 from the new ZR1.